Posted on Thu, Feb 16, 2012 : 5:58 a.m.
Only the walls of Ypsilanti’s First Baptist Church were left standing after a 1937 fire destroyed the landmark at the corner of West Cross and North Washington streets. 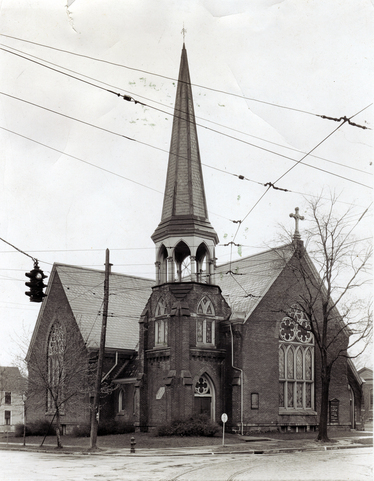 The tall spire of Ypsilanti’s First Baptist Church, on the southeast corner of West Cross and North Washington streets, where Janowiak Funeral Home is now, was a local landmark from 1884 to 1937. The church was dedicated on September 4, 1884. The building was cruciform in shape, and was 91 feet long and 67 feet wide and had a 97 foot tall spire. At the front of the building was the chapel with folding and sliding doors opening into the audience room. “The floor of the audience room is arranged and seated in amphitheater form, with five large aisles leading down to the front. There will be three large memorial windows in the house. The portions of plan which enable an advantageous use of attractive wood furnishings are the breast work of the orchestra and organ loft behind the pulpit platform, and the spandrels. Of the latter, there are dividing the ceiling into four panels,” reported The Ypsilanti Commercial of November 17, 1883. 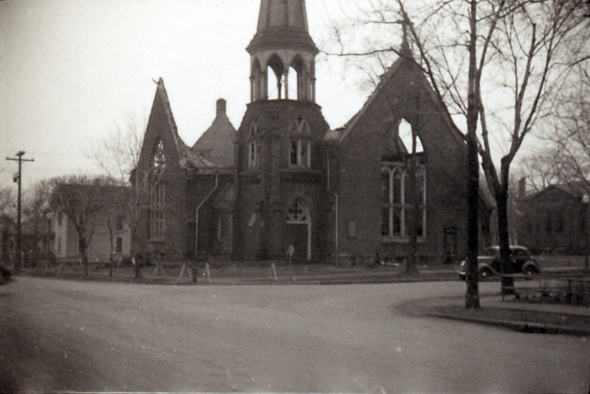 The First Baptist Church stood as a local landmark on the southeast corner of West Cross and North Washington streets in Ypsilanti until it was destroyed by a fire in 1937. The last time anyone saw the beautiful interior of the church, was Thursday, February 18, 1937. That evening residents in nearby homes smelled smoke, but were unable to find the source. Firefighters from the Cross Street Firehouse, directly across the street from the church, searched the area for the source of the smell, but could not trace it to its origin. The firefighters returned to the firehouse, and turned in for the night. They were awakened at 4:15 a.m. by the sound of a car horn from a passing driver. “When firemen arrived, after discovering the blaze, smoke was issuing from the windows and the rear of the building above the furnace room was blazing furiously. Flames soon burst through the roof and the inside of the building became a roaring furnace,” reported The Ypsilanti Daily Press of Friday, February 19, 1937. “The men broke through windows on the south side and played streams of water into the flaming mass, but were handicapped by a wall of smoke,” noted the account. In the end only the walls of the church and the steeple were left standing. The cause of the fire was never determined. The congregation of the Baptist Church accepted the offer of the Presbyterian Church to meet in their building until a new structure could be completed. The Baptist Church chose to move to a new location at 1110 W. Cross St. Some 83,000 bricks were reclaimed from the old church, cleaned by the women of the community and used in the construction of the new church. The new church was dedicated on October 9, 1938. James Mann is a local historian, storyteller and author. His books include “Ypsilanti: A History in Pictures,” City of Ypsilanti Fire Department 100 Years,” and “Our Heritage: Down by the Depot in Ypsilanti,” written with Tom Dodd. His most recent book, “Wicked Ann Arbor,” was published by The History Press. From the description I thought I was in Westminster Abbey. Wow sounds like fire was spectacular. So it sounds like the furnace room was the cause? Thanks for interesting trivia. Thu, Feb 16, 2012 : 3:46 p.m. If I'm not mistaken, this tragedy happened because Ypsilanti did not have an income tax. Vote YES on May 8th to SAVE YPSILANTI with higher taxes. Thu, Feb 16, 2012 : 3:08 p.m.
Thu, Feb 16, 2012 : 2:16 p.m.
what difference does this make today.who cares?